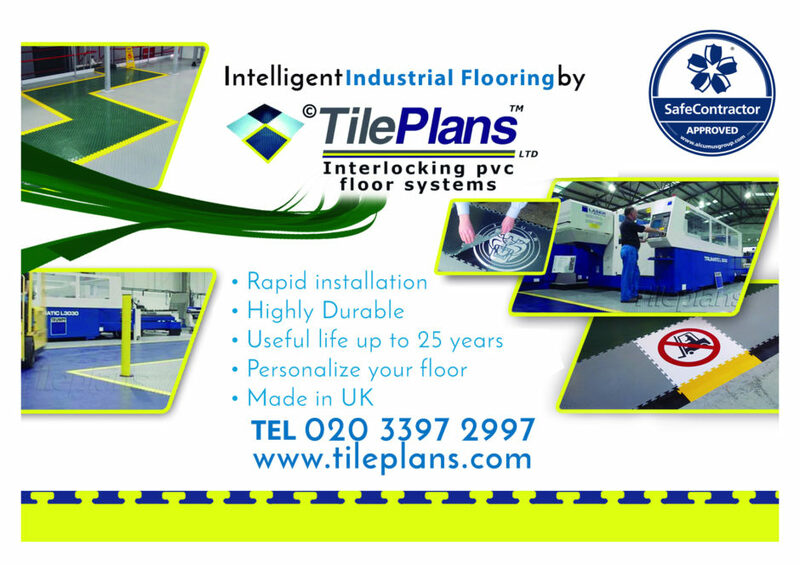 Construction professionals can rest assured that the flexibility afforded by TilePlans industrial floor tiles is a key advantage for many new-build and refurbishment projects. They can effectively design the floor to their own – or the client’s – specifications and meet rigorous European and American health and safety regulations in the process. 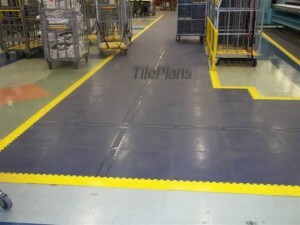 For instance, factories, warehouses and laboratories may use different colours of TilePlans industrial floor coating to separate production or storage areas from walkways for staff and driveways for fork lift trucks. In airports, different colours might be used to distinguish, for example, check-in, security and Customs areas from shopping areas and pedestrian zones from driveways used by passenger buggies. Catering establishments may use a similar concept to separate queuing and dining areas and, where applicable, smoking and non-smoking areas. The applications are limited only by the designer’s imagination. Accessories in the TilePlans PVC interlocking floor tiles range aim to assist architects, designers and construction professionals with floor design and represent a ready-made solution to common flooring issues. The accessories include line marker tiles, edging ramps, corner ramps and clear ‘logo’ tiles. Line marker tiles are used to separate areas within the floor and act as boundary markers. Yellow is the most popular colour for line marker tiles as it contrasts starkly with colours such as black, grey, dark green and navy blue. Clear ‘logo’ tiles are transparent and measure 500mm by 500mm, the same size as the standard tiles. They are principally used for health and safety or for corporate branding or advertising, depending on the client’s objectives. 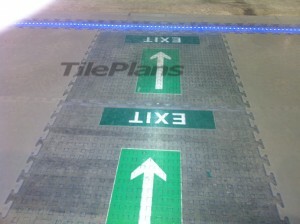 Signs are placed under the clear tile or tiles and are therefore incorporated within the floor. Warning signs might be included for health and safety, the company logo for corporate branding, or details given of special offers for marketing and promotional purposes. The sign can be changed by simply lifting the tile and replacing it with another sign – so this is a versatile method of communicating messages to staff or customers. For those who require a sign or logo to be permanently incorporated within the floor there are alternative ways of achieving this, either by printing the graphic on the tile or by etching it into the tile by a water-jet method. This entry was posted in Industrial Flooring and tagged health and safety, industrial floor coating, industrial floor covering, Industrial Floor tiles, Industrial Flooring, Industrial Flooring Solutions, industrial flooring systems, Line Marker, PVC Floor Tiles, Safety Line Marker. Bookmark the permalink.